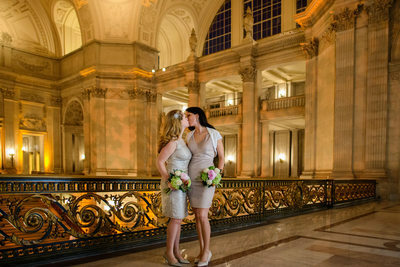 This is a photo compilation of many of our recent San Francisco City Hall Weddings. Dubnoff Wedding Photography has specialized in City Hall marriages for over 10 years with over 400 photographed in that time period. We are also one of the few wedding photographers to obtain official approval from the City Hall Event Office to shoot weddings at this amazing venue. This allows us to photograph special events, reserved weddings and Saturday marriages. We have also obtained the necessary insurance coverage and other important documentation needed to legally photograph these special events. 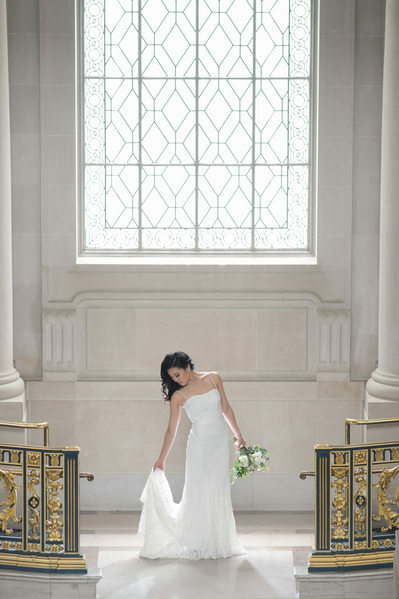 Reserved weddings take place in either the Mayor's Balcony or the 4th Floor North Gallery. When booking either of these locations, you receive the added advantage of privacy and security. The Events Department ropes off the entire area for 1 hour and sets up chairs for the comfort of your wedding guests. City Hall is a public building so paying the extra money and reserving one of these areas may be the best choice for you, especially if you have a large crowd of guests. The cost is $1,000 which is substantially more money then the standard civil ceremony booked in the Rotunda area. However, if you compare this price to other San Francisco venues it is an incredible bargain. Try to get married at any comparable locale in the greater San Francisco area for even 10 times that price. You can't do it! You could also make the argument that SF City Hall is prettier than any of them. 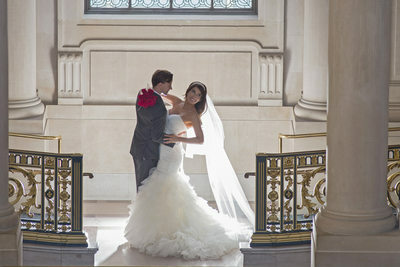 For more information about City Hall private weddings, click the link. 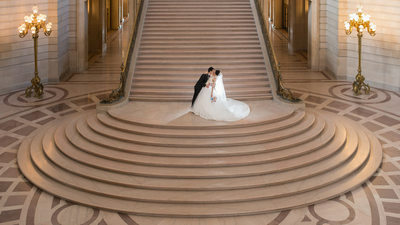 We have provided invaluable information for navigating your way through the entire matrimonial process at SF city hall. This includes obtaining your marriage license and booking your ceremony date and time. We have also provided a section called: "Helpful Hints On Your Wedding Day" with answers to many of the frequently asked questions that we hear from our brides and grooms. Our multiple years of experience shooting weddings at city hall has provided us with mountains of useful information that we would love to share with you. 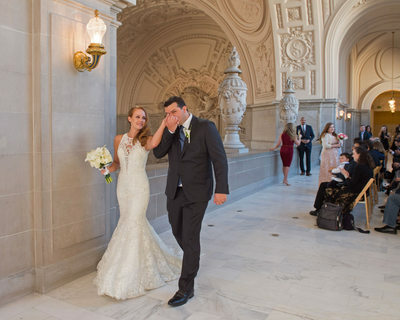 We like this venue so much that we are willing to provide anyone who asks free advice on how to have a successful wedding at San Francisco City Hall. Despite the comparative simplicity of a civil ceremony, there are still a number of issues that come up and we are happy to impart our knowledge to you. 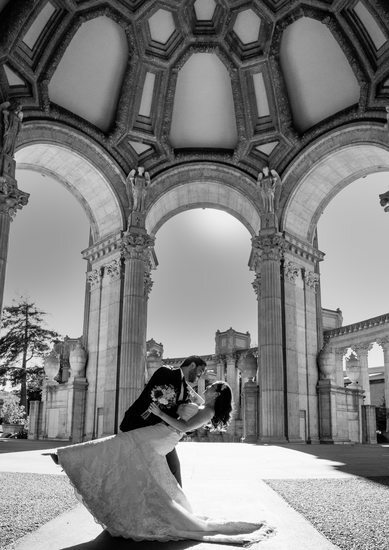 If you would like to book Dubnoff Wedding Photography for your City Hall marriage please go to our San Francisco City Hall Prices page. There you will find important information about booking us and also package details. 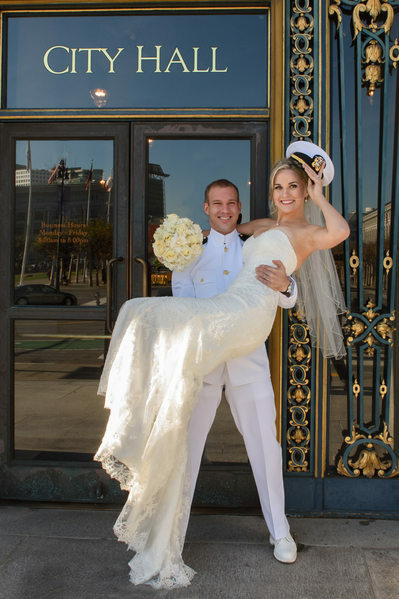 If you are just interested in gaining more knowledge of the entire procedure, please feel free to roam around the city hall section of this San Francisco wedding photography website. We are thrilled to assist you, whether or not you hire us for your wedding. No doubt you have explored many San Francisco City Hall photography websites and have noted the differences in style. 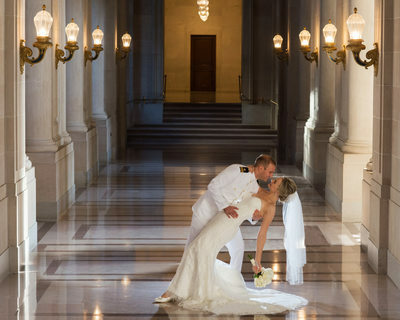 The vast variety available among the top city hall photographers is pretty amazing. We are often asked how we would define our own style. Many of our clients tell us that they booked us because we stood out from the other photographers they had looked at. Our photos are super sharp and technically correct. They especially emphasize the beautiful architecture present in the building. Not that we are clearly better then the rest, just different. 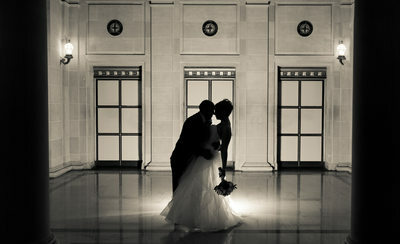 Our philosophy which has lead us to photographing well over 400 weddings in the past 7 years focuses on architecture. If you compare our photographic work to others you will note that our images tend to show off the details and the beauty of the building itself. Taking nothing away from the Bride and Groom, because we make sure they are prominently featured. However, you may notice more wide angle shots and images that display the patterns present in this type of French architecture. If you love the unique beauty of this grand old historic building, check out our images above. The other thing we bring to the table is image diversity. This means that there will not be a common theme or style within your final image set. You will enjoy many different types of final images including, close ups, blurred backgrounds, wide angle shots and candid photography. We feel that it is important to provide our customers a wide variety of wedding pictures to choose from. We feel our positive attitude and friendly demeanor set us apart. We will have fun with you on your wedding day and make sure the photo session is not too complicated or precise. We have an easy going style which will help you relax while your photos are being taken. This makes our clients feel much more at ease and produces better and more natural wedding photos. 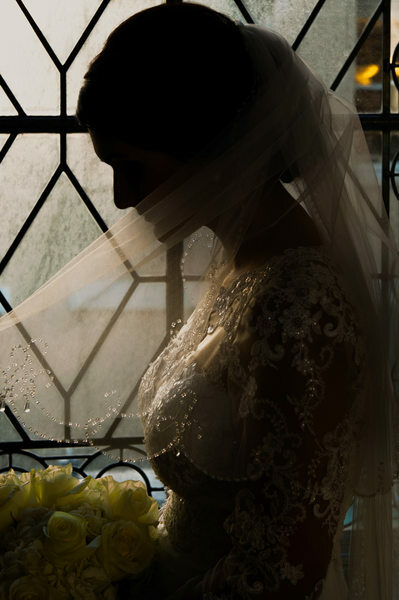 This is the ultimate goal, to provide the bride and groom with memories to last a lifetime. We have found that if we smile and converse with our couples, they smile back. We are looking for natural reactions and emotion in our city hall photography, not posed and stiff. 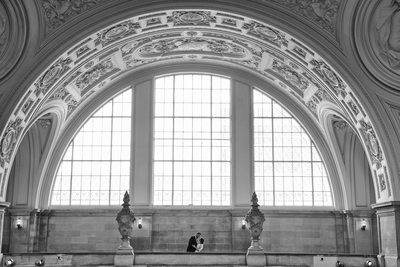 This approach has served us well over the past few years and has helped make us one of the leading San Francisco City Hall wedding photographers. We hope to continue to provide this friendly service for many years! I wanted to take a moment to discuss these amazing people wearing robes who are officiating the civil ceremonies at San Francisco City Hall. Who are they? Are they judges? Do they work at city hall? How much are they paid to do this job? You might be surprised to learn that they are definitely not judges despite the fact that they may look like it. These great people are deputized marriage commissioners that volunteer on a weekly basis to enhance your marriage experience at this Town Hall. Some of them have been doing this for close to 20 years and many have just started recently. They all have one thing in common, however... They want to help make your wedding day special. Otherwise, why would they be doing this for free? The County Clerk's office provides each Marriage Commissioner a script to read from when they perform your marriage ceremony. Some stick very close to the script, but many others add their own little nuances to the proceedings. Why do they do this you might ask? I have had the occasion to query many of them on this exact question and the answers vary, but there is a common theme. They all seem to want to be around happy people while performing a vital community service. Many of them are retired and just want to have some fun activities in their lives. As a San Francisco city hall marriage commissioner, you have the pleasure of meeting people of all cultures and nationalities. People come from all over the Earth to have their nuptials at SF city hall. Yes, this is a common question and one that is not easily answered. After all, this is San Francisco, the weather and thus the light can change in an instant. We shy away from making specific recommendations because of the variability in not only the outside weather, but also the crowd flow. Assuming that there is no fog, the morning light can be quite riveting. It tends to be soft and mellow with useful spots coming in through the south facing windows. Before 10:00 am there tends to be less tourists wandering around, though weddings have already started by this time. Mid-day offers slightly harsher light with a more neutral color. We will make good use of our off camera professional lighting no matter what time of the day it is, but we especially like to use it around noon. On a typical summer day, the tourist and wedding traffic begins to diminish after 3:30 pm. The light becomes warmer and very controllable with some beautiful photo opportunities using the North facing windows. 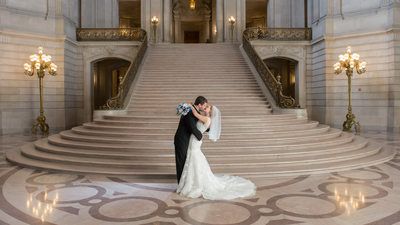 Of course later afternoon also brings the possibility of Special Events occurring at San Francisco city hall so this can sometimes close down certain parts of the building for wedding photography. Not to worry, our professional experience helps us navigate these challenges and we will always find wonderful spots to take you for your pictures. As mentioned, all of these lighting nuances change with the fog. As it rolls in our lighting changes with it and we have to adjust. You may walk into San Francisco city hall on an early morning foggy day and it seems so dark in the building you wonder if it's day time. This rapidly changes as the day wears on, but it is important to understand why you will benefit from hiring a professional city hall wedding photographer to deal with these challenges.